Two unlikely friends, an old woman and a boy with special needs, take an aging champion to Westminster Dog Show, and heal their troubled families. Seventy year-old Bess Rutledge has fantasized about winning the Westminster Dog Show all her life, but now she has decided she is too old to follow her dream. She meets Benny, an angry fourteen year-old with mild autism and ADHD, who has a dream of his own: to impress his self-absorbed mother. He becomes convinced that winning Westminster with McCreery, Bess’ aging champion standard poodle, will finally make his mother proud of him. Getting Bess to go along with his plan, however, is not going to be so easy. At the heart of Almost Perfect there are two people and two dogs. Benny, a fourteen year old boy with special needs, wants a dog more than anything else. His love of dogs leads him to meet Bess Rutledge. Bess has been a top breeder of standard poodles for years, but she is closing her kennel without ever achieving her dream of winning the Westminster Dog Show. There are also two special dogs in this story: Bess's dog McCreery, who is a champion poodle and the sire of Breaker, a mischievous puppy who plays a very important role in this book. I love books about puppies and dogs, so I knew I would enjoy this read. I certainly did! The details about the dog show world were new (and very interesting!) to me. I have already recommended this book to several dog friends. I'm sure they will enjoy it too. I found the changing focus back and forth between Bess and her life and Benny and his family and school very interesting. I liked learning about their separate lives because it made their unlikely friendship that much more moving. The dogs, McCreery and Breaker, stole the show. The author did a great job at capturing their individual personalities. I especially loved watching Breaker's growth from a puppy to a young dog. I listened to this book in Audible audiobook format. Caroline Miller did a wonderful job with the narration, especially in the separate voices and personalities of Bess and Benny. This book translated very well to audiobook format. At first I found the character of Benny a bit disconcerting because he seemed so much younger than his 14 years. If I had not been told he was 14, I would have assumed he was a much younger child, perhaps 6 - 8. As the book went on, I got used to him seeming very young for his age and my interest in the story about Benny's love of dogs and friendship with Bess became primary in the read. The setting of the dog community and dog show world was especially interesting. I enjoy watching the Westminster Dog Show, and especially enjoyed reading this book just before this year's Westminster, February 16 - 17. I would recommend this book for dog lovers from middle school age to adult. It is a family friendly story with an appealing, heartwarming tone. I kept thinking, as I read, that this would make a very good Hallmark movie. Do you love dogs? Do you enjoy a warm, uplifting story? Then you will really enjoy Almost Perfect. Diane Daniels Manning is the co-founder and director of The New School in the Heights, a therapeutic school in Houston, Texas which helps children dealing with social-emotional challenges find success in school and life. She has a Ph.D. in Education and a post-doctoral M.P.H from Harvard and is a practicing child psychoanalyst certified by the American Psychoanalytic Association. Formerly, she was the Director of the Reading and Learning Disabilities Clinic at Tufts University, Lecturer and Research Associate in the Department of Behavioral Sciences at Harvard, and Chair of the Department of Education at Tulane University. 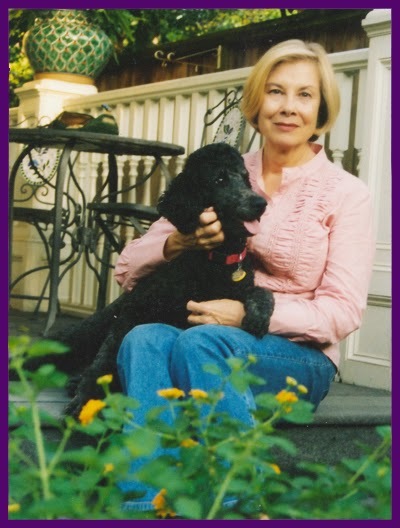 She learned the inner workings of dog show kennels by writing an authorized oral history of a lifetime President of the Poodle of Club of America. Her writing awards include the Faulkner-Wisdom Novella Prize and the Women in Film and Television Short Script Competition. When not at The New School, Diane and her writing partners, a Standard Poodle named Misty and a rescue cat named Elvira, convene at the keyboard to share great thoughts and plan the dinner menu. Almost Perfect Trailer V1-2 from Kaizen Marketing on Vimeo. I received this book from iRead Book Tours in exchange for an honest review. Not only do I love stories with animals in them, but I also love a good read about friendship between older & younger folks! Great review! This sounds like a book I would enjoy. I like the idea of the multi-generational friendship aspect of the story. Thank you for reading and reviewing ALMOST PERFECT. I especially appreciated your saying you liked the back and forth point of view between Benny and Bess because it added to the understanding of their unusual friendship. And, of course, I love it when any dog lover enjoys the book! I don't need my comment to be anonymous. I just didn't want to risk messing up my URL. Will try now.Please combine with my earlier comment thanking you so much for reading and reviewing ALMOSt PERFECT! LOVE animal stories! Thanks for sharing! Great reviews. Interesting read almost perfect. Diane, thanks so much for visiting and commenting. I really enjoyed your book and have recommended it to friends. I have always loved all Standard Poodles that I've met, and your book only reinforced the impression I have of them. I have never read a book with dogs as the main characters but I love watching the Westminster Dog show! I'd love to read this, but hope I won't be distracted by the adorable cover! I'm off to enter the giveaway. This sounds like a wonderful story! If I win a copy of the book, I'll put it in my class library (I'm a 5th grade teacher). I think it would inspire my students. Sorry, I missed the giveaway. Thanks so much for linking up with Literacy Musing Mondays this week! Your post received the most clicks and is featured for the upcoming linkup starting Sunday (2/22) at 6 p.m. Hope you will continue to linkup with us! I love your reviews. Mary, thank you so much for visiting and thanks for the feature! I love your Literacy Musing Mondays!